Equally shared in crowns in the heavens. 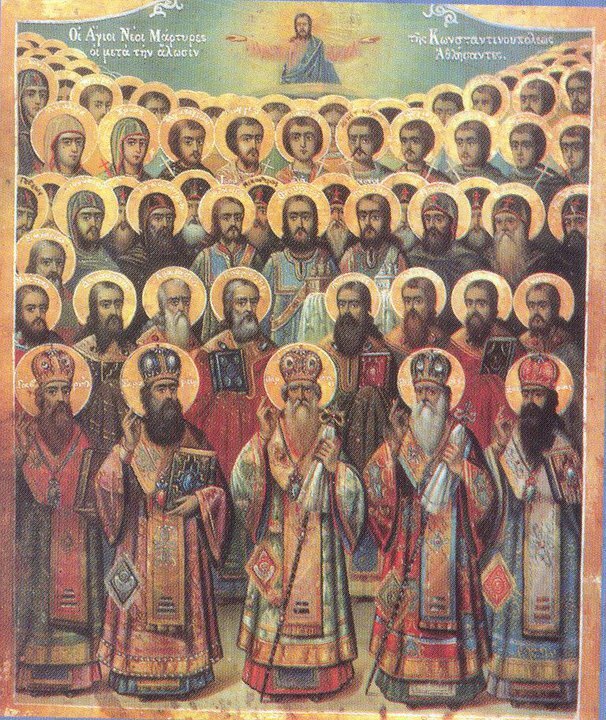 The Holy Martyrs Stephen, Barnabas, Trophimos, Dorymedon, Kosmas, Damian, Savvas, Vassa, Abramios, and others with them, died for their faith in Christ, though we do not have any further details. On September 19th we commemorate the Holy Martyrs Trophimos, Dorymedon and Sabbatios, and they are probably the Holy Martyrs Trophimos, Dorymedon and Savvas that we commemorate today. A blood-stained stone from the head of the child. 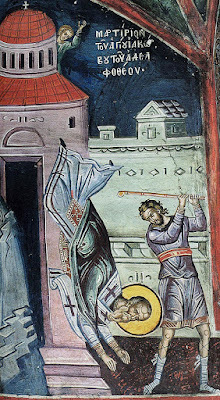 The Holy Child Martyr met his end by being wounded in the head with a stone. The twelve maidens stretched forth as each hour. The Holy Twelve Maidens met their end by being hung in the middle of the portico. Being dead they spill ever-flowing myrrh. The Holy Martyrs and spouses Seleukos and Stratonike met their end by the sword, whose sacred relics gushed forth ever-flowing myrrh. Thus crushing the long legs of error. The Holy Three Martyrs of Melitene met their end after having their legs crushed. To Asterios, Claudius and Neon. Contesting by the sword, were seen as new stars. Doing away with the ancient wood's deceit. 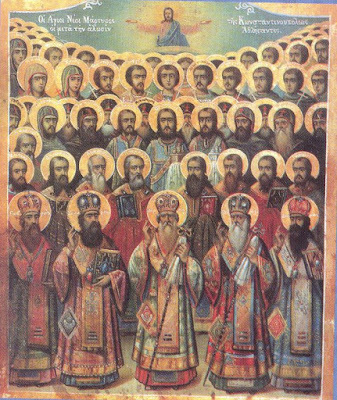 During the first consulate of Diocletian, when Lysias was governor of Cilicia in the year 288, these Saints contested who were Christian siblings that lived together, and had much wealth. With them was their stepmother, because their mother had earlier died, and afterward their father died also. Because the stepmother sought to unjustly hold the belongings of their parents, she betrayed them to the governor, accusing them of being Christians. These youth, standing before the governor, said to him: "We now disdain all our belongings, O governor, and on behalf of our faith we will endure all evil that will follow us. Our stepmother, who was not well chosen to replace our mother, knew that she did not betray us to you to protect the religion of your gods. No. Rather she is seeking to unjustly take the inheritance of our father and mother, since it consists of much." When the governor heard this, it seemed that he agreed with the purpose of their stepmother, and he wanted to put the Saints to death, in order for him to also acquire a portion of their parental inheritance. Therefore he immediately ordered that Claudius spread out the four parts of his body on the ground, so that his back could be lacerated with rods. They then suspended him by his hands, while his feet were burnt with lit coals. Then they cut into his sides with sharp brass. They then crushed him with bricks, and burnt him with papyrus plants. Meanwhile the Saint heard the governor say to him: "Sacrifice to the gods that you may escape this." He responded: "As I told you once, for the faith of Christ, I disdain even this death. Therefore do as you want, O judge." Thus when he was taken down from the wood, he was cast into prison. After this Asterios stood before the court, and Lysias said to him: "What is your name?" 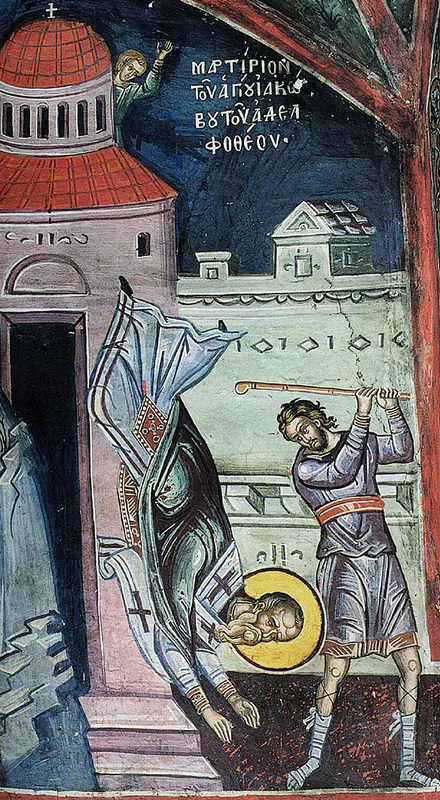 Because the Saint remained silent, the governor ordered that the teeth of the Martyr be smashed. As long as it took for his teeth to be smashed, the whiner yelled: "Sacrifice to the gods and save your life!" Despite the punishment he endured, the Martyr upon hearing the whiner did not cease to respond, saying: "Do whatever you want, O governor, do it and do not be neglectful. For I do not wish to deny Christ my God." Then he was suspended, and his sides were lacerated. They also burnt his feet, since they laid out underneath lit coals. After this they beat him with rods, then cast him into prison. Then Neon stood in court. When he also was asked what his name was, he answered: "If you want to learn my name, O governor, know that I am called Neon. Have no hope to learn more beyond this. For I am the brother of Claudius and Asterios, who were punished before me. It is not possible to separate from them. But for my confession of Christ, behold now I stand before you. Therefore delay not to do what you wish." Thus he was spread out over the ground and harshly beaten, and under his feet were laid out lit coals. After beating him for a long time, they cast him into prison. The next day, Lysias sat in the court, and brought before him Saint Claudius, saying to him: "Tell us if you have changed and considered better thoughts?" The Saint responded: "Today I stand before you brave and fearless, more than yesterday. For while I was being tortured I became stronger and braver." Therefore they immediately tied his hands and feet and suspended him, and brought out mechanical instruments, that enter into the joints and lock the members of the body. They also brought out tongs, in order to remove the soles of his feet and hands from their place. After a long time they brought him down half-dead and cast him into prison. Saint Asterios then stood in the court, and saw Lysias, who said to him: "What do you say? Have you considered sacrificing to the gods, to be liberated from tortures?" The Martyr answered: "He who believes in the true God, and has all his hopes in him, does not regard death, but disdains it, even if he has to endure a myriad of tortures." Then Lysias said: "Hang him up, and lacerate his sides, cut off his hands and feet, and with a fiery spit burn his thighs." When this took place, and the Martyr felt severe pain, he said: "When God sees that which you are doing to his servant, impious one, may he return the justice appropriately." 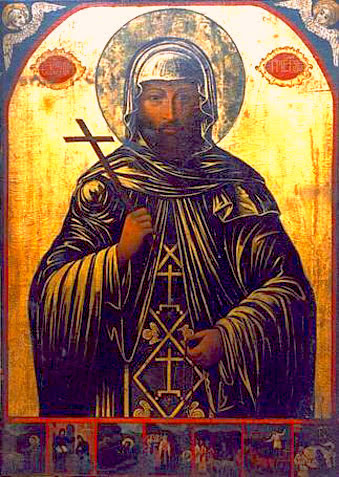 Lysias then ordered for Saint Asterios to be cast into prison, and he brought Neon before him. Because he also remained unchanged in his faith, he was again made to lay down on the ground and he was lacerated with ox-hide. When his entire body was wounded, he was cast into prison. The governor then ordered for the sister of the Saints to be brought out, Neonilla. Because he found her to be more firm than a rock in her faith in Christ, he ordered that her face be beaten. They then tied her up by her feet and suspended her, then they whipped her feet. After this they hung her up by the hairs of her head. Then they shaved her head to dishonor her. And spreading her out by her four members, they lacerated her body with raw hides. Then laying her down on her back, they placed on her breasts and womb lit coals. In this way the blessed one delivered her soul into the hands of God. Her honorable body was then placed into a sack and cast into the sea. The Holy Martyrs Claudius, Asterios and Neon were beheaded outside of the city, and their bodies were thrown to the beasts and the birds to be devoured. In this way they met their blessed end, these Holy victorious in Christ Martyrs and siblings, and received the crown of the contest. Was brought Cronion his son who did not reverence Cronus. Found the most blessed life. Could separate the two times five plus three men from you. Coming to know Christ who led him to the light from darkness. 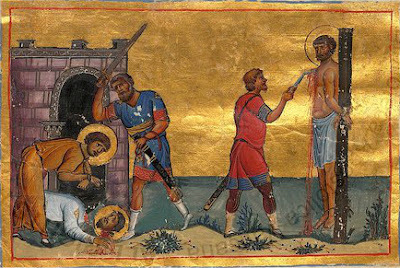 On both October 30th and March 25th we commemorate an anonymous Executioner, who came to the knowledge of Christ, then met his end by martyrdom in a dark prison. Dometios was eager for the sword to be brought down. The Holy Martyr Dometios was a Phrygian by birth who met his end by the sword in 361 under Julian the Apostate. He is said to have provoked his own arrest by publicly attacking the error of worshiping and sacrificing to idols in the theater of Caesarea in where people had gathered for the festival games to honor their gods. For this he was ordered to be beheaded with several other Christians. The Holy Martyr Manuel is also commemorated on March 26th with the Holy Martyrs Kodratos, Theodosios and the Forty others with them. They were from somewhere in the East. When they would daily see Christians being put to death by the idolaters, they together agreed to boldly confess their faith in Christ, in order that they may inherit the Kingdom of Heaven. Of their own will they delivered themselves over to the ruler of that place, who at that time was examining and punishing many Christians. Standing before him, they confessed they were Christians. For this they were imprisoned, and after a few days they were taken out of prison, and they were suspended naked on wooden poles, and their sides were torn. Then they were dragged over caltrops, and finally beheaded, by which the blessed ones received the crown of martyrdom. In the furnace they burned with divine longing. The Holy Nine Martyrs met their end by fire. They are commemorated on both October 30th and March 12th. We find two Anastasias in the Lives of the saints, both of whom were of prominent and famous families and who confessed their faith. Both were daughters of mighty Rome. The first was married against her will by her parents, but never came together with her husband, nor even slept with him, pretending she was ill, though in reality because he was a pagan. She was thus able to preserve her virginity, because, a few days later, her husband died. She therefore lived the whole of her life in asceticism, prudently and with all the virtues, giving all her property as alms to the poor. She visited the holy martyrs in their places of confinement, urged them to bear their torments for the sake of the Lord, counseled them and helped them with their material needs. 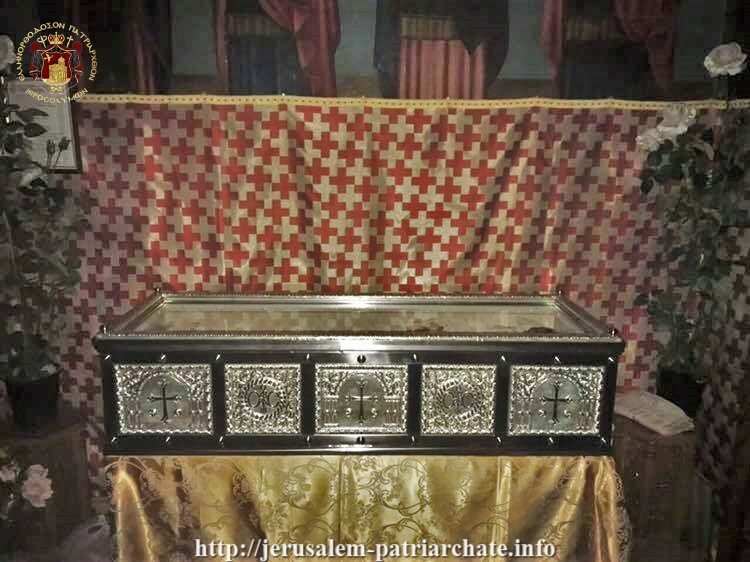 When the tyrants murdered them, she stole their holy relics and buried them with devotion and love. While she was about her daily tasks, the impious learned of her, and she was martyred by fire, rising to the Lord as a fragrant scent. We keep her memory on December 22. Athanasios the glory of priests. The Holy New Hieromartyr Athanasios of Sparta in Attaleia (mod. Antalya) was a priest and martyred in Mudanya in the year 1653. No other details are known of his life. 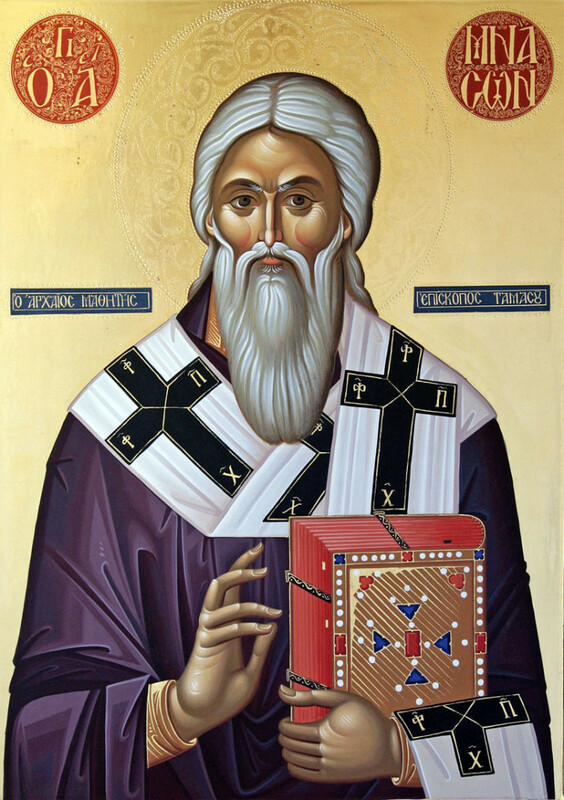 A Canon was composed in his honor by Meletios Syrigos, according to Saint Nikodemos in his New Martyrology. As one who is triumphant through love of the Lord. Saint Melitini, after she was accused of being a Christian before the ruler of the land, stood before him. First her face was beaten, then her entire naked body was exposed. In this way she stood as one who is led in triumph through Christ for many hours in the middle of the court. Standing naked in this manner, she ridiculed the ruler and his idols. The blessed one considered it an honor, to be a recipient of dishonor for Christ. After being tormented with many torments, she was kept unharmed. Finally she was wounded all over with a sword, and in this way delivered her soul into the hands of God. The Holy Martyr Savvas the General met his end after receiving wounds on both his right and left sides. 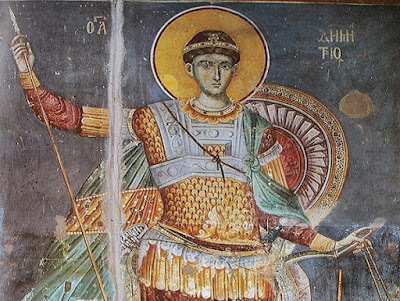 It should be noted that there are two other Holy Martyrs known as "Savvas the General", one of which is celebrated on April 18th and the other on April 24th. It seems that since all three have significant differences, they are probably three different people. * The name Savvas is a palindrome, which can be read the same backward and forward. Just as his name can be read both ways, so also was he wounded on the two sides of his body. Cyril knew the promise for the sword. And Mines falling by the same met his end. Minaios in no wise comes into wrath. The tension in the relations between the Ecumenical Patriarchate and the Patriarchate of Moscow concerning the Church in Ukraine, a country that is in fact in the neighborhood of Russia, is perhaps the most contemporary example of how the balance or change of powers in the geopolitical chessboard also effects ecclesiastical developments. For the Metropolitan of Nafpaktos and Agiou Vlasiou, Hierotheos, an experienced hierarch, all that is happening is likened to an earthquake: "Seismologists in an earthquake talk about a rupture and seismic vibrations and expect their evolution. Something like that is happening in this case too." Philopappou Hill, which is located across from the Acropolis, took its name from the Syrian philhellene consul Gaius Julius Antiochus Epiphanes Philopappos, who was exiled in Athens between 75-76 and 87-88 A.D. The Athenians, after his death, built a majestic monument on the top of the hill to honor his memory, known as the "Monument of Philopappou". Ancients called this the Hill of the Muses, as well, because of some temple that existed there. The Dimitria, or the festival of Saint Demetrios, the patron saint of Thessaloniki, was an exceptional feast for the whole of the Western world. The satirical dialogue known as the Timarion, which was written in the 12th century, declares that the city attracted at this time "not only locals or those of one race, but people from all over Greece and of every ethnicity - Greeks from all over, various tribes of Bulgars from among those who lived between the Danube and Southern Russia, Italians, Spaniards, Portuguese and Celts who live beyond the Alps." Saint Demetrios hailed from Misti–Konakli in Cappadocia (near Nigde), where he lived a holy life and became a habitation of the Holy Spirit. 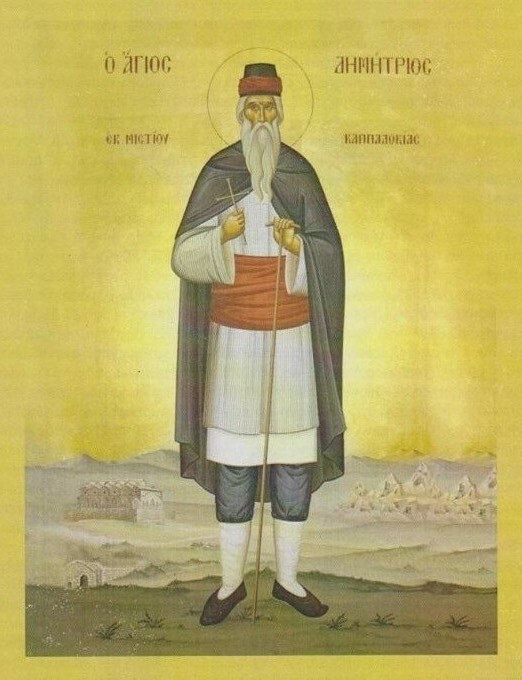 Between 1860 and 1870, the Saint appeared in a dream to an illiterate but pious woman, Eleutheria Elekidou from Misti, revealing that it was the will of God that his relics be exhumed, for his body was incorrupt. She led her husband and all the inhabitants of Misti to a catacomb between the villages of Misti and Limna (Golcuk), where they were gushing fragrant myrrh, and since then are a source of rich blessings and many healings to those who invoke him. Our Venerable Father Athanasios came from a noble family of Constantinople and was well educated. His father wanted him to enter into public service at the Treasury, but Athanasios desired to live a monastic life dedicated to Christ, so he fled his home secretly and went to the Monastery of the Symvouli in Bithynia. His father rushed after him, and unable to change his mind to return home with him, his father took him home by force and made him change his clothes from that of a novice to rich clothing. His father shut him in a room and tried to persuade him to live his life in the world, but Athanasios tore his clothes into little pieces. His father then clothed him in more valuable clothes, and Athanasios repeated to them what he did with the first. This enraged his father, and he beat the young and naked Athanasios covering him with wounds. The wounds caused parts of his shoulder and back to rot, and doctors had to come and remove parts of his flesh. Meanwhile Athanasios said: "Even if my father crushes me to pieces, he still will not separate me from the love of God and will not turn me away from my intention." This pricked the heart of his father, who said: "Go, my child, in the good path, chosen by you, and may Christ be your helper and deliverer from every hostility." You shed your sweet blood as a drink-ffering to Christ. The Holy Martyr Glykon met his end by the sword. Leptina left behind on the ground her stout flesh. 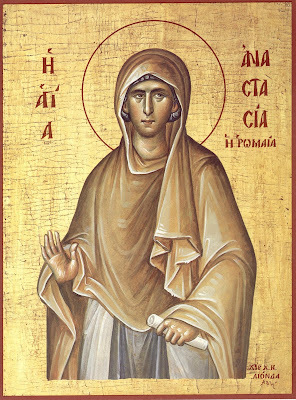 The Holy Martyr Leptina met her end by being dragged along the ground. Having Basil as a fellow athlete to the sword. 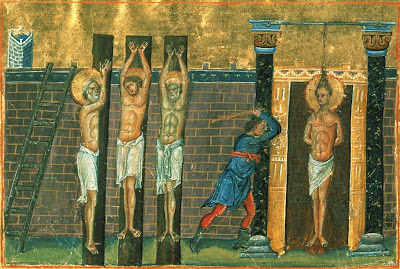 The Holy Martyrs Artemidoros and Basil met their end by the sword. And finally Makarios was not called to be alone. The Venerable Makarios, Bishop of Paphos, met his end in peace in 1688. He is commemorated by the Church on October 25th and February 8th. In which both athletes together were pressed. 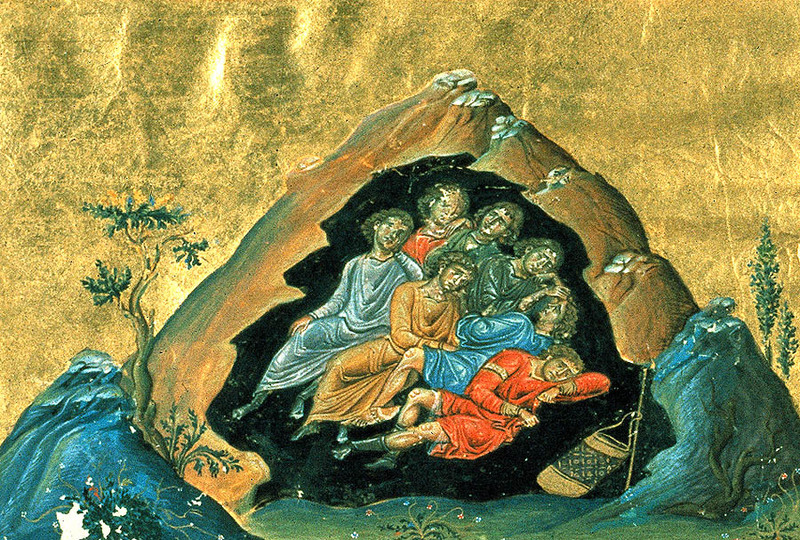 The Holy Two Martyrs of Thrace met their end by being pressed in between two rocks. * A kylistra, according to Aristophanes, was a place in which horses rolled around in. The punishment led to luxuries. 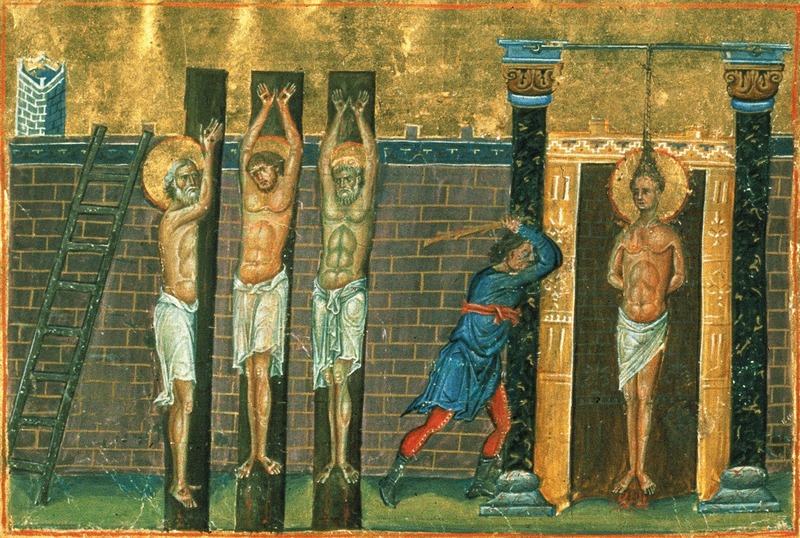 The Holy Martyrs Valerius and Chrysaphios met their end by the sword. Chrysaphios is also known in some manuscripts as Chrysaphos, while Valerius is known in some manuscripts as Valerinus. The divine dance produced divine crowns. The Holy Martyr Sabinos met his end by fire. For a brief cutting, O how many crowns he received! The Holy Martyr Valerinus met his end by the sword. Our Venerable Father John lived in a period of terrible suffering and war between the Russian, Polish, and Swedish governments at the turn of the 16th to 17th centuries. In 1592 the Swedes besieged the city of Pskov. From 1608, for seven years, Polish forces attacked under the leadership of Lisovski. It was only in the week before the death of Saint John, through the intercession of the Pskov Caves Icon of the Mother of God and the Pskov Saints, that Pskov was delivered from the besieging army of the Swedish king Gustavus Adolphus. Nerdon had a divine end in the vessel. The Holy Martyr Nerdon met his end by fire. Surrendering his soul, he hastened to the sword on your behalf. 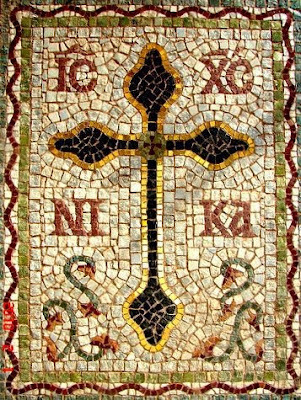 The Holy Hieromartyr Akakios the Presbyter met his end by the sword. George Synkellos (died after 810) was a Byzantine chronicler and ecclesiastic. 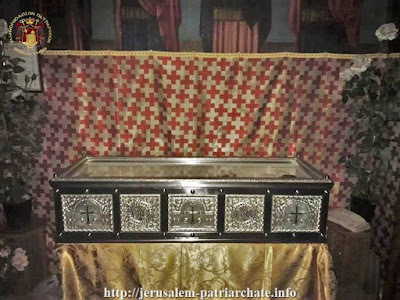 He had lived many years in Palestine (probably in the Old Lavra of Saint Chariton or Souka, near Tekoa) as a monk, before coming to Constantinople, where he was appointed synkellos to Tarasius, Patriarch of Constantinople. He later retired to a monastery to write what was intended to be his great work, a chronicle of world history, Ekloge Chronographias (Ἐκλογὴ Χρονογραφίας), or Extract of Chronography. There he quotes the second-century historian Hegesippus, also quoted by Eusebius, concerning the martyrdom of the Apostle James, who was also the first Bishop of Jerusalem. The writings of Hegesippus are for the most part lost to us. You also hastened to live a victorious life. Who ran the fire of Olympus O Word. The Holy Two Child Martyrs met their end by being forced to run over fire that was spread out on the ground. Will These Human Bones Come to Life? A sermon delivered in Shanghai on 22 October 1948, when once again there seemed to be absolutely no hope for the deliverance of Russia from the Communist Yoke. There was no limit to the grief and despondency of the ancient Jews when Jerusalem was destroyed and they themselves were led away into the Babylonian captivity. "Where are Thine ancient mercies, O Lord, which Thou swarest to David?" (Ps. 88:50), they cried out. "But now Thou, hast cast off and put us to shame... They that hated us spoiled for themselves and Thou scatterest us among the nations" (Ps. 43:10-12). But when it seemed that there was no hope for deliverance, the Prophet Ezekiel, who was likewise in captivity, was made worthy of a wondrous vision. "And the hand of the Lord came upon me," he says of this. The invisible right hand of the Lord placed him in the midst of a field full of human bones. And the Lord asked him: "Son of man, will these bones live?" And the Prophet replied: "O Lord God, Thou knowest this." Then the voice of the Lord commanded the Prophet to say to the bones that the Lord will give to them the spirit of life, clothing them with sinews, flesh, and skin. The Prophet uttered the word of the Lord, a voice resounded, the earth shook, and the bones began to come together, bone to bone, each to its own joint; sinews appeared on them, the flesh grew and became covered with skin, so that the whole field became filled with the bodies of men; only there were no souls in them. And again the Prophet heard the Lord, and at His command he prophesied the word of the Lord, and from the four directions souls flew to them, the spirit of life entered into the bodies, they stood up, and the field was filled with an assembly of a multitude of people. South of the Acheiropoiitos Monastery, near Lambousa, survives an undecorated chamber carved into a rock to which the locals have attributed the name "Saint Eulambios". This Saint found martyrdom in 296 AD at Nicodemea and is not connected with Cypriot tradition. 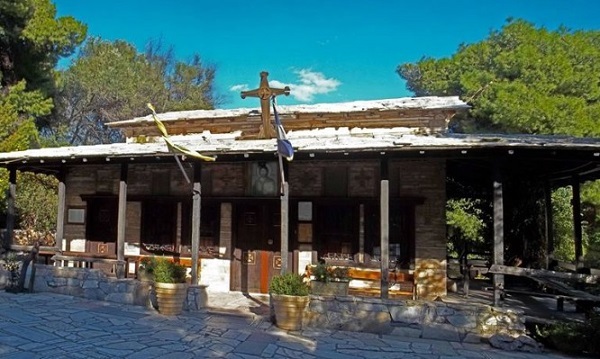 However, a short distance east of the Acheiropoiitos Monastery survives a church built in the 16th century in the place of an older church and is dedicated to Saint Eulalios. 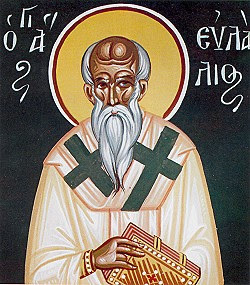 According to Leontios Machairas, Saint Eulalios was the "most holy bishop Lapithos." 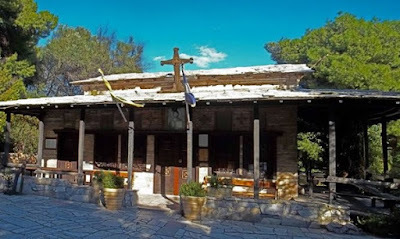 Perhaps this was the hermitage of this Saint, and the name was changed by local tradition due to confusion with the name of the nearby city of Lambousa (Eulalios - Lambousa - Eulambios). Besides, even today the refugee inhabitants of Lambousa (ancient Lapithos) identify Saint Eulalios with Saint Eulambios. He was called to plunge into the sea. The Holy Martyr Zacharias met his end in the sea. On October 21st we commemorate another Zacharias who met his end at sea. It is not known if they are the same person, since the one we commemorate today is just known as a Martyr while the one we commemorate on October 21st is known as a Venerable Martyr. Both also have different iambic verses. By the athlete-killing worshipers of stone. The Holy Martyrs Ebora and Enoa met their end by stoning. Some consider them to be the two male disciples of Saint Milo commemorated on November 10th, who there are known as Eboras the Presbyter and Senoas the Deacon, and are sometimes translated in English with the names Aborsam and Senoe. Saint Basil, Bishop of Trebizond, is absent in the Synaxaria, however he is a local saint of the Church in Trebizond, where his commemoration was kept yearly with a Service of Praise, which Athanasios Papadopoulos-Kerameus (+ 1912) found in a manuscript in Trebizond, as he records in his Byzantine Chronicles S.12, 143. He lived during the reign of Emperors Leo VI the Wise (886-912) and Constantine VII Porphyrogenitos (913-959). For the holiness of his life, he was numbered among the Saints of Trebizond. Friends through piety, O how they loved each other! The Holy Hieromartyrs Felix the Presbyter and Eusebius the Deacon met their end by the sword. They are perhaps the same Holy Martyrs commemorated on October 7th, where Eusebius is said to have been a Presbyter and no clerical office is ascribed to Felix. And you are delivered from the art of determining syllogisms. Saint Leontios the Philosopher met his end in peace. 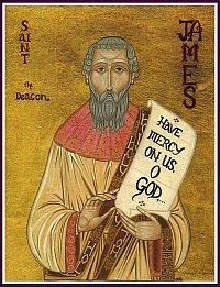 Saint James lived in the seventh century, and assisted Saint Paulinus of York (Oct. 10) in evangelizing the north of England, known as Northumbria. Following the death of Saint Edwin (Oct. 12) in 633, the northern kingdom experienced many trials, including military defeats, famine, and plague. The year 633-634 was so fraught with misfortune that it became known as “The Hateful Year.” Saint Paulinus accompanied Saint Ethelburga (Apr. 5) back to her native Kent after the death of her husband King Edwin, leaving Saint James behind to care for the new converts in northern England. Honoring Christ who is two according to essence. The Holy Forty Child Martyrs met their end by the sword. By the sword he lives on the earth before the fall. Saint Mnason, Bishop of Cyprus, met his end by the sword. It is most probable that this Saint Mnason is the same as Saint Mnason the Old Disciple commemorated on October 19th, both of whom are said to be Bishops of Cyprus, but the former alone is mentioned in the Synaxarion of Constantinople while the latter is commemorated as a local saint. This is despite the fact that the Saint Mnason of today is said to have been martyred by the sword, while the Saint Mnason of tomorrow is said to have reposed in peace. On Saturday night, September 30/October 13, 2018, the Divine Liturgy was celebrated at the Holy Lavra of Saint Savvas the Sanctified according to the Typicon of the Lavra. The Liturgy was officiated by our Father and Patriarch of Jerusalem Theophilos with co-celebrants the His Eminence Metropolitan Nikolaos of Mesogaia and Lavreotiki and the Most Reverend Archbishops, Aristarchos of Constantina, Philoumenos of Pella, and the Most Reverend Metropolitan Joachim of Helenoupolis, Hagiotaphite Hieromonks, Arab-speaking Priests, as well as visiting Priests from other Churches, Archdeacon Mark and Deacon Demetrios. To dwell for a long time in the heavenly household. Our Holy Father Malos, leaving behind the world, wealth and relatives, went to deserted and uninhabited places. There the renowned one occupied himself, rejoicing in fasting and vigils and other hardships. His face was joyful, and in the name of Christ he performed various miracles; cleansing lepers, banishing demons and giving sight to the blind. These things he did even when he was still alive. After departing to the Lord, he left behind his all-honorable body as a source of healing. He received the grace to have myrrh gush from it, for the averting of every form of suffering and the healing of unhealable illnesses. As the Lord said: "Those who glorify Me I will glorify" (1 Kings/Samuel 2:30). Another was in the midst of the fire with Leontios. 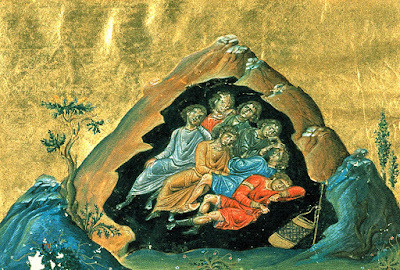 The Holy Martyrs Leontios, Dometios, Terence and Domninos met their end by fire. 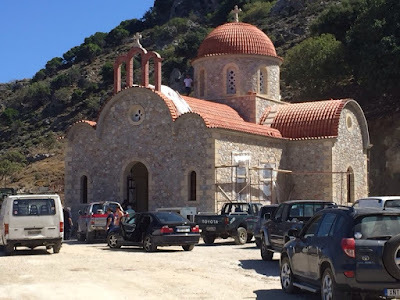 On 2 October 2018 the consecration of the Church of Saint Nikephoros the Leper took place in his hometown of Sirikari, a small mountain village located in western Crete, in the regional unit of Chania, Greece. It is part of the municipality of Kissamos. The consecration was officiated by Ecumenical Patriarch Bartholomew, Patriarch Theophilos of Jerusalem, Archbishop Chrysostomos of Cyprus, Archbishop Irenaeos of Crete, as well as representative Bishops and Clerics from throughout the world. The church is located a short distance from the house the Saint grew up in, which was recently restored and has become a place of pilgrimage.